“Cluster headaches are a sort of plague from hell; I wouldn’t wish them on my worst enemy. When I am in the middle of an attack, I just crawl around on the floor crying, using every foul word and phrase I can think of and asking to die.” These impassioned statements seem at odds with Geoff, a 51-year old history teacher who is quietly spoken and dressed immaculately. Geoff was diagnosed as having cluster headaches. After 7 weeks, the attacks stopped as suddenly as they started but the headache specialist he had seen had warned Geoff that they were likely to return. There is a documented case of someone with cluster headaches going 25 years between attacks, but it is more usually a year or two. In Geoff’s case it was 9 months. “At first, when the headaches stopped I was afraid to go to sleep in case I woke up in pain again. The first attack of the night always came around 2am, which I now know is fairly typical. Apparently, one of the triggers is the onset of rapid eye movement sleep, which occurs about 2-3 hours after going to sleep,” explained Geoff. Geoff’s wife, Helen also began to dread night coming, as she felt completely helpless to do anything to help. “Night after night he would wake up about 2am and start groaning. Usually he went downstairs – luckily we have a converted cellar that we used as an office and he goes there so as not to wake our three children. They would be really distressed if they saw their dad rolling around on the floor, crying and moaning and beating his head on the floor,” Helen told HeadacheExpert. “When a headache is in progress, I also swear and curse – and I never do that in the rest of my life. I just want it to end so much, the pain is utterly overwhelming,” said Geoff. 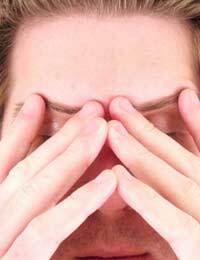 Cluster headaches are very difficult to treat. They do not respond to medication in the same way as migraines and seem to be completely different in origin, although both types of headache are vascular. Patients who experience cluster headaches have tender spots in the carotid artery in the neck and spasms in the artery may be one of the causes of the pain. “I have taken ergotamine to stop attacks and a daily dose of this seems to prevent attacks when I am in a ‘headache attack’ time. I have also obtained an oxygen cylinder and mask designed for people with cluster headaches as breathing in 100% oxygen for a few minutes usually ends an attack, particularly at night,” reported Geoff. However, for the last few years, Geoff’s doctor has prescribed intravenous sumatriptan, which both Geoff and Helen have been taught to administer at home.